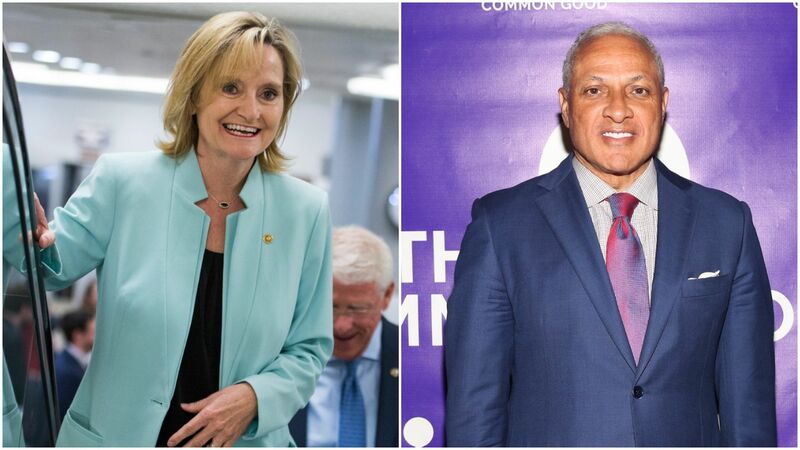 Sen. Cindy Hyde-Smith and Mike Espy. Photos: Tom Williams/CQ Roll Call; Sylvain Gaboury/Patrick McMullan via Getty Images. Mississippi's special Senate election — once thought to be a foregone conclusion — has taken on a national profile and is now being actively targeted by Democrats as the race heads to a runoff next week. The big picture: The contest between Republican Sen. Cindy Hyde-Smith, who would be the first woman elected to represent the state in Congress, and Democrat Mike Espy, who would be Mississippi's first African-American senator since Reconstruction, has devolved into what Politico calls "a bare-knuckle brawl infused with ugly racial politics." At a campaign event this month, Hyde-Smith told a supporter that if he invited her to a public hanging, she would be "on the front row." She said in a statement that it was "an exaggerated expression of regard, and any attempt to turn this into a negative connotation is ridiculous," Roll Call reports. Espy's camp responded that her comments "have no place in our political discourse, in Mississippi, or our country." Derrick Johnson, the president of the NAACP, said that "Hyde-Smith's decision to joke about 'hanging,' in a state known for its violent and terroristic history towards African Americans is sick." She also said that suppressing college student votes might be a "good thing" because it would make it "just a little more difficult" for "liberal folks in those other schools" to vote, CNN reported. Hyde-Smith, who took over for former Sen. Thad Cochran earlier this year, was nine points ahead of Espy in an October NBC News/Marist Poll. It was expected that she wasn't going to receive 50% of the vote on election night because of a vote split with Republican competitor on the ballot, thus pushing the race to a runoff, per the New Yorker. Since Hyde-Smith's contentious comments, Espy has worked to win over black voters and progressive white voters. Per CNN, Epsy told a group of more than 100 women over the weekend that his election would portray "a Mississippi that's moving forward, a Mississippi with a better image." Epsy has come under fire for his own baggage during the campaign, including being indicted — and acquitted— of corruption charges in the 1990s, the New York Times reports. The runoff is set to take place next week on Nov. 27, and the only debate in the race is set for Tuesday. Showcasing Espy's momentum, prominent Senate Democrats and potential 2020 candidates like Kamala Harris and Cory Booker have already visited Mississippi to campaign — and more could be coming after the Thanksgiving holiday. Trump will visit the state to back Hyde-Smith with two rallies on Nov. 26 — in Tupelo and Biloxi.